How long have The Ravelers been together? we have known each other, and have played in other situations together for over 30 years! How did you get the name, The Ravelers? "...Plenty of Jam Jars, by The Ravelers." Pat and his brother Steve, and friend Dale who both sit in occassionally, thought that would be a cool obscure way of being related to The Beatles, so the name stuck. George was acting like a DJ on a radio station, and announced that fictitious song by "The Ravelers", a fictitious band. The Beatles then go on to "sing" a really bad song called, "Plenty of Jam Jars". To hear George Harrison's quote,Click Here--It will take a few moments to load, but you will hear it automatically. Who is in The Ravelers? The Ravelers play so many different kinds of events with different types of people and you play hundreds of songs. How do you know what songs to play, and when? We take an educated guess at what will work for a particular crowd. All the songs we play are familiar older tunes. We have learned which types of crowds like which types of songs through experience. We can tell when it's time to play a ballad, a jazz tune, some country, or when to rock it up. Heck, a rousing "polka" is never out of question(...and you'd be surprised where we have been asked to play one)! We can tell when people want to dance or just sit and listen. Check out the "Video Clips" page for live samples of many songs. How do you decide which songs to learn? We play many songs that are considered "standard" classic rock songs. These songs work everywhere we play. Then we learn songs that we really like, but may be a little obscure. The crowd has heard it before, but can't remember who did it or what the title is...those are the fun tunes. Having fun with these songs keeps things fresh at city concerts, nightclubs, special events and other dates. Of course we do many Beatle tunes...some very familiar and some "off the beaten path". The guys really have The Beatle's vocals and harmonies down very well. We also pick songs that will get a crowd to participate by singing along or dancing a certain way. We have a certain number of songs that are humorous that can be related to a gig. And finally, people request songs that we have never played before. If one of us knows the lyrics (or can at least sound like he knows them...don't listen too closely! ), and we can sound like we know the music (our something interestingly close) ... we do them. And if it works the first time, chances are that we will keep refining it as we play it more. Rehearse?...what's that?!? Most of our material evolves and changes from gig to gig. When you see us play, you see us rehearsing and trying new things. That's what keeps these old songs fresh. We rely on each others' ability, experience, and chemistry to make it work. We play them the way we feel them that night. There seems to be something different happening every gig. We call it, "playing by the seat of our pants". This helps to keep old songs fresh and fun to play by putting our own creativity into them. Sometimes there is a feeling that "magic" just happened. Hopefully we don't "butcher" anything, but you may hear a mistake once in a while...see if you can catch us! Actually, we get together to "rehearse" a few times a year, to work on songs that we really want to put together a certain way. Yes. The Ravelers has become our version of "Boys Night Out". Some people play golf, softball, bunco, etc. We happen to play music. The chemistry between the four of us is very relaxing. The music is natural, and the fun you see us having is genuine. We hope you are having as much fun as we are! Please join us for "boys night out"! Can we request songs for you to learn? Sure. Just click below on the "Click Here to Ask Away!" link and give us a suggestion. Remember that we usually learn fairly familiar tunes that are about 15 to 20 years old or more. If we like your idea...we will do it! All requests for "Free Bird" will be politely ignored. Why do The Ravelers always wear matching clothes? We really want to look like a band that cares about their "work". We attempt to wear the colors of a wedding reception, holiday colors around Christmas, and so on. It also takes the guess work out of what to wear individually. Plus, it has also been a fun part of our show when we wear shirts that are a bit unusual. Don't be afraid to add to our wardrobe, either. We just need four matching shirts of an unusual nature that will go with black pants...size large or x-large makes it easy. If you bring them to a gig, we will change into them on the spot! What is an "Un-Raveled" acoustic show? We thought it would be fun to do an "un-plugged" version of our material, which is really the way we rehearse. We tried it at a coffee house and the people really loved it...which made it really fun for us! It has become a blast to be in an intimate setting where a lower volume is necessary and the audience can really listen and be a part of interesting versions of these songs that take on a new "flavor". Pat plays acoustic guitar. Hai plays acoustic guitar, sax, flute, and sometimes piccolo. Martie's keyboards are played in a different style, and Rob plays light percussion instead of a drumset. There are also many songs we do acoustically now that we don't do in our full "rock 'n roll" stage set-up. We are now getting more and more requests to play "Un-Raveled" at dinner functions, book stores, coffee houses, smaller bars, weddings, and other gigs that require a lower volume. Check out the "Video Clips" page for some live video from a couple of Un-Raveled shows. When you see an "Un-Raveled" show in our schedule, come on out for an interesting experience! How do you get your "gigs"? All of our dates, shows, concerts, "gigs" are usually booked by word-of-mouth and booked directly by The Ravelers. It has been a great compliment to be able to play 50 to 100 dates a year through referral and return engagement. Wedding parties, corporations, cities, and other organizations have been tremendous about passing our information on to those others who want fun musical entertainment for their event. We try hard to keep that momentum going by giving a quality performance, and being very easy and fun to work with. How much do The Ravelers cost? The bottom line is...we love to play, and we want our audience to have fun. Hopefully, both of these points come through very clear in our show. We want to fit into the budget that parties and organizations have alotted for the entertainment so we can have our "boy's night out" regularly! The Ravelers are not overly expensive or cheap. We have guidelines we think about in terms of distance traveled, and total hours away from home (our wives let us out for only so long!). 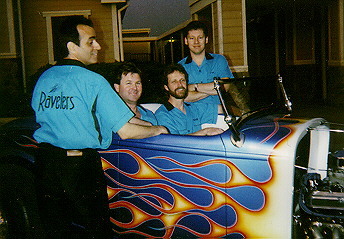 The Ravelers have played from San Francisco to San Diego, so we look forward to a road trip now and then. All you have to do is let us know your budget, and we will do our best to fit your needs. So...organize an event, party, or concert and let us help you rock it up with some fun! How do we contact The Ravelers to book a date for our event, party, or concert? You can call Pat at (909)593-5956 or Hai at (951)204-1582. You can also email The Ravelers by clicking on the link below. Rob will get the email. Then, we talk to each other immediately so we make sure we are all available!! !